A Week Until The 60Th Anniversary Kick-off! Just a friendly reminder that a week from now, Friday, June 28th, the Costa Mesa 60th Anniversary Celebration kick-off weekend will be underway. Dozens of volunteer committee members and city staffers, led by Committee Chairman Mike Scheafer, Vice Chair Melinda Lowery and Public Affairs Manager Dan Joyce, have spent thousands of hours cobbling together what certainly looks like a wonderful way to officially kick-off the 60th birthday party for our city. You can visit the official web site for this celebration, HERE. You can see the venue map, HERE. You can see the schedule of events, HERE. You can see the map showing road closures, HERE. This is going to be one fantastic weekend, with music for everyone - even folks my age - exhibits, food and fun. And, except for the big bucks entertainment, it's all free! Well, the food's going to cost you, but you can have a lot of fun for ZERO bucks. Oh, yes... there will be a booth set up so you can provide your own, personal input for the General Plan Update that is being conducted. 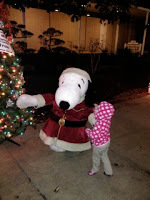 Look for Snoopy, who apparenlty found an early summer gig this year. I don't know if you saw it, but a very slick, glossy magazine published for the celebration, showed up with my local newspapers today. I don't know which one it fell out of, but it's very cool and provides some super historical perspective on our city. Kudos to former Daily Pilot publisher Tom Johnson and his crew at Johnson Media for a job well-done. So, neighbors, be sure to include some time for a visit to the celebration next weekend. It's going to be a blast! 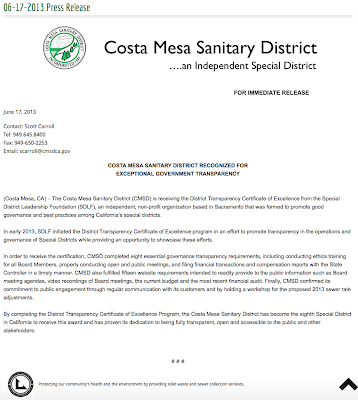 Slipping through the cracks earlier in the week was the press release from Scott Carroll, General Manager of the Costa Mesa Sanitary District announcing that the District had recently been awarded the District Transparency Certificate of Excellence by the Special District Leadership Foundation (SDLF). The full text of the press release, which explains in detail the nature of this award, is below. Click on the image to enlarge for easier reading. 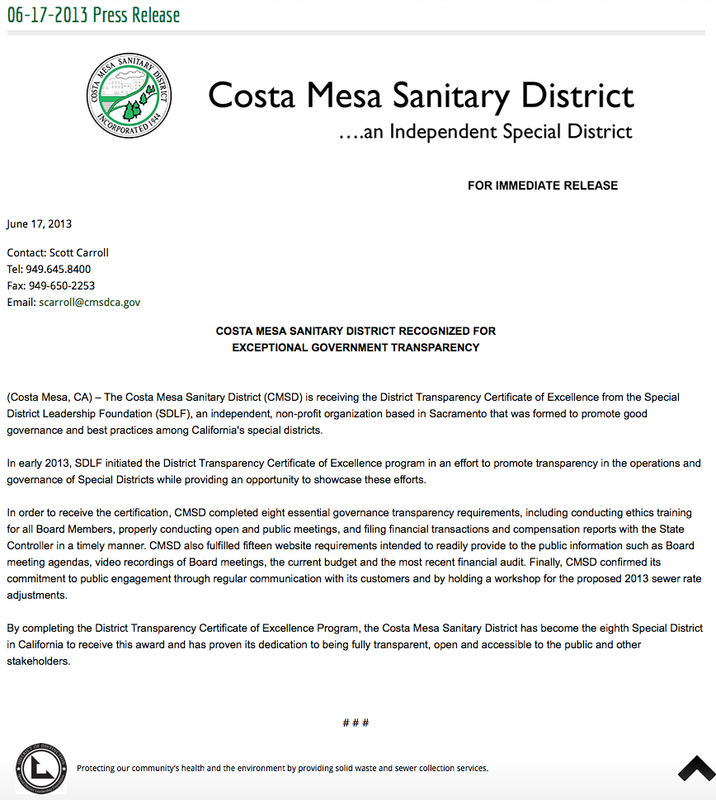 Kudos to the Costa Mesa Sanitary District Board and the staff for this acknowledgement. There are a couple events scheduled at Fairview Park this Saturday, June 22nd that might be fun and informative for you all. 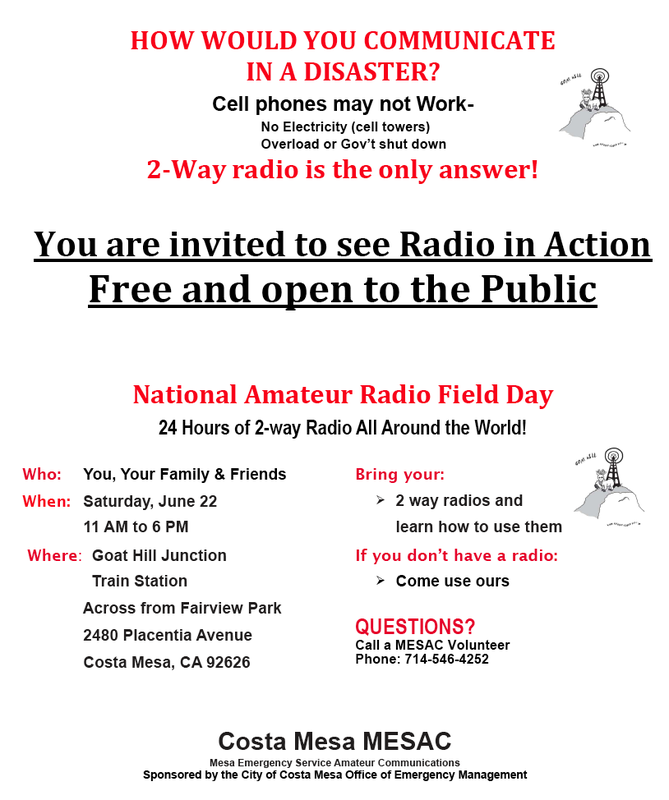 Then, right across Placentia Avenue at the Goat Hill Junction Train Station the good volunteers from Mesa Emergency Service Amateur Communications (MESAC) will provide an opportunity for members of the public to participate in the National Amateur Radio Field Day. As indicated in the flyer below (click to enlarge it) volunteers will be on the site from 11:00 a.m. to 6:00 p.m. 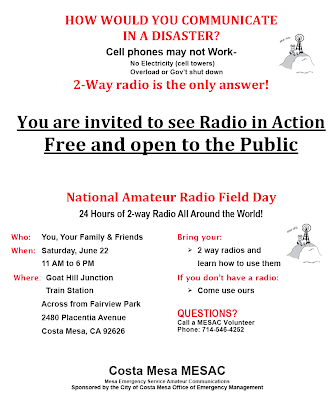 This is a great opportunity to learn about the operations of 2-way radios from folks who really know their business. 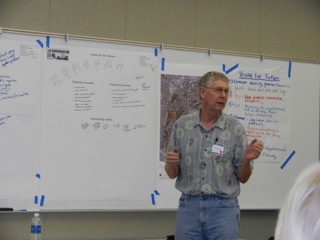 Last night I joined almost 30 other people, nearly half of which were city staffers, in the first "visioning" exercise as part of the public outreach for the development of the city's General Plan. The consultants who guided this process hoped for twice the number that showed up, which is one reason for the large number of staffers. They were going to help groups at individual tables form their thoughts. Everyone participated and it worked out just fine. 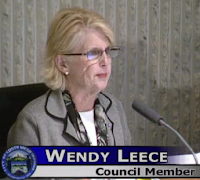 Council member Wendy Leece was the only elected official in attendance. I saw no planning commissioners nor were there any parks and recreation commissioners present, either. Among the city staffers at the meeting were Director of Public Services Ernesto Munoz, Acting Development Services Director Claire Flynn, Zoning Coordinator Willa Bowens-Killeen, Principle Planner Minoo Ashabi, Senior Planner Mel Lee, Management Analyst Hilda Veturis, Transportation Services Manager Raja Sethuraman, and brand new Economic and Development Services Director/Deputy CEO Gary Armstrong, who just took San Benito County through its General Plan Update before starting with Costa Mesa a week ago. Several other staffers were on hand to help, too. I hope they will forgive me for not listing them individually. 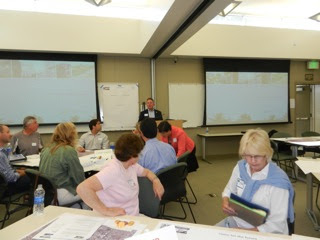 The attendees split into three groups that had been randomly selected and set about trying to craft their "vision" for Costa Mesa through the year 2035. Yeah, I know... the General Plan is a document with a decade shelf life, but we were encouraged to think further out than that. 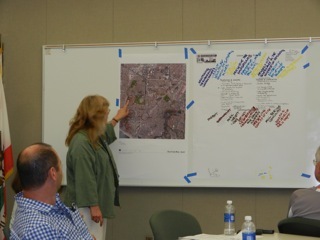 The process required each group to address the positives and negatives about Costa Mesa. On the plus side, Fairview Park, The Fairgrounds, South Coast Plaza, Neighborhood Parks, Diversity, Strong Neighborhood Identity were among those things I overheard being mentioned. On the negative side, we heard about Crime, Traffic and Homelessness, to name only a few. The individual groups spent an hour working through the issue, then their anointed spokesperson presented the results of the effort to the assembled mob as a whole. It was fascinating to see how similarly each group thought when the process was done. The next opportunity for the public to participate in this process will be during the 60th Anniversary Celebration on June 29 and 30. A booth will be manned at which members of the public can step up and provide their input. Snoopy will be on hand to help out. The booth will be available all day Saturday and from 3-5 on Sunday. 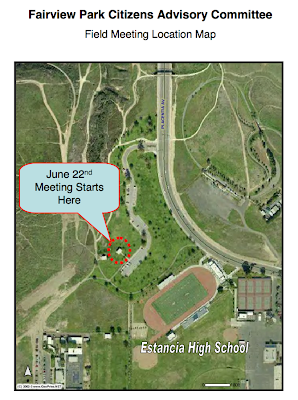 The next formal meeting will be held late in July and is scheduled to address Land Use. Please tell your friends and neighbors about this wonderful opportunity to participate in creating the map by which the future of our city will be guided. I noticed something I thought was peculiar at the meeting last night. There were no members of the public present that I would associate with the current city council majority. Not a single person who had stepped up and spoken for initiatives Mayor Jim Righeimer and Mayor Pro Tem Steve Mensinger have launched over the past couple years. 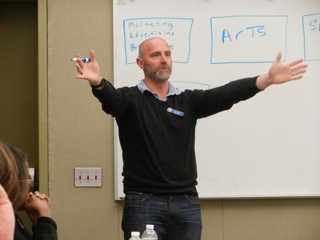 There were some familiar faces - folks who attend many meetings and speak at most - but there were also several "newbies" - folks who don't usually get involved. We need more of those. And, by the way, I heard no mention of the word "Charter" heard last night during the discussion of the vision for the future. 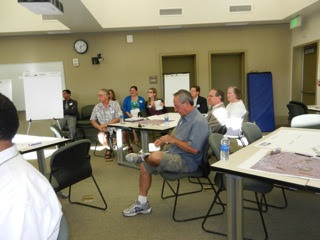 'Twas another long, long night at Costa Mesa City Hall yesterday. Once again the City Council meeting ran past midnight - 12:35 to be precise. It was an even longer day for the council, which preceded the regular council meeting with a two and a half hour closed session that began at 4:00 p.m. The short version of events - the staff reports for the meeting were fully 3 inches thick - we have a balanced budget (that included $650,000 for Fairview Park lights); we don't yet have a Public Nuisance Ordinance; we're switching insurance brokers; we're changing the rules for Field Use allocations; Tom Hatch got his raise; some CDBG fund recipients got a nice surprise; somebody else is going to be managing our money and the most qualified person WAS NOT selected to fill a vacancy in the Pension Oversight Committee. That may be enough information for most of you, but here are the details. After beginning thirty minutes late due to the Closed Session dragging out for two and a half hours, the meeting began with a much-deserved recognition of Costa Mesa High Schoolers. The young women of Costa Mesa Cheer were recognized for their prodigious accomplishments this past year - they were ranked 6th internationally for their activities. 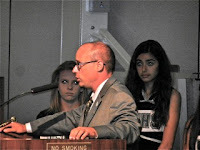 Mayor Jim Righeimer was joined by Costa Mesa High School Principal Dr. Phil D'Agostino presenting awards. D'Agostino stressed that the average GPA for the cheer squad was 3.83! An astounding number for any group of high school scholar/athletes. This photo shows those who attended last night. The seniors were at "Senior Recognition Night" at another venue. Congrats to the ladies. GENIS...During Council Member Comments Sandra Genis encouraged community members to get involved in the update process for the city's General Plan. 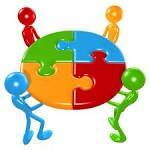 There's a "visioning" meeting tonight at the Emergency Operations Center (EOC) beginning at 6:00. She also expressed concern about item #13 on the Consent Calendar, although she didn't pull it for separate discussion. She was concerned that the prolific use of consulting companies to perform building inspection services has led to a lack of continuity and consistency in the way projects are inspected and suggested more in-house inspectors should be hired to retain that continuity. 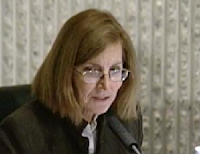 She also addressed concerns made by residents about the Banning Ranch development, indicating that virtually ALL the traffic from that project would be directed onto Costa Mesa streets. Wendy Leece gave a report on the Relay For Life event held last weekend. 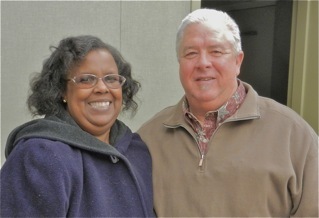 She attended the 27th anniversary celebration of Someone Cares Soup Kitchen, emphasizing how many Costa Mesa residents - including many residents of the Tower on 19th (formerly Bethel Towers) use it. She also stressed the need for residents to be safe during the July 4th holiday Fireworks season - it's no longer just one evening in our town. She also expressed concern about Righeimer's commentary in the Daily Pilot on Hatch's raise that was published BEFORE the council had actually voted on it. 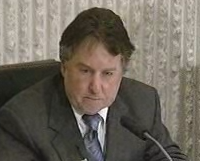 Contract City Attorney Tom Duarte basically said "no big deal". I spoke with him later on this subject and he said he'll have to study the timeline, indicating that council members cannot discuss "strategy" discussed in closed sessions. That's not how I read the Brown Act, so he's going to get back to me. 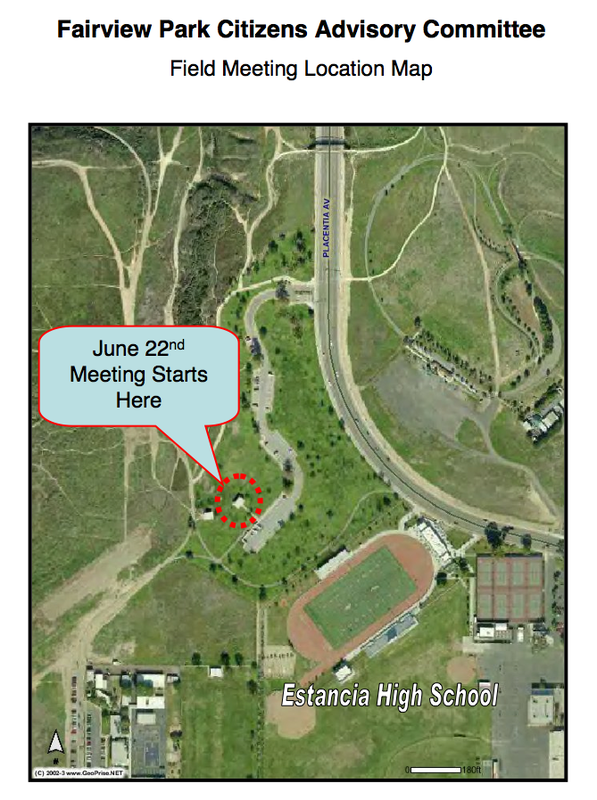 Steve Mensinger asked Public Services Director Ernesto Munoz about the status of a radar speed sign on Susan Street in response to the public outcry about the tragic accident that took the life of an Estancia High School graduate over the weekend. Munoz said the sign will be acquired using grant funding, but nothing is in the pipeline yet. 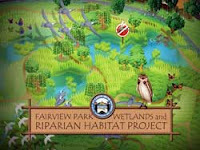 Mensinger also mentioned the Fairview Park tour Saturday morning beginning at 8:00 a.m.
Gary Monahan said he'd keep his comments short and brief - I smiled - and congratulated ALL graduates this spring. Righeimer spoke about how he and Mensinger did ridealongs with the CMPD Monday night when, in cooperation with the Orange County Probation Department, snatched up seven violators and sent them back to jail. As he extolled the virtues of the officers involved I found myself thinking, "It's about time you began to appreciate the work our police force does to keep this city safe!" Righeimer, apparently now "Mister Law and Order", said, "If you're on probation in Costa Mesa we're going to check on you. If you're not straight you're going to jail!" Tough talk from a guy who has no clue about law enforcement. During his time CEO Hatch introduced our new Economic and Development Services Director/Deputy CEO, Gary Armstrong. He also mentioned the impact of the 60th Anniversary celebration that will be held in 10 days. He spoke of the Fireworks "challenges" - I'm beginning to hate that word - and of the new Fire Department re-deployment that began Sunday with the advent of two leased paramedic units. This is the very beginning of Interim Fire Chief Tom Arnold's plan to improve emergency response service in Costa Mesa and save a bucket of money, too. Hatch also mentioned the General Plan process, indicating the "visioning" meeting tonight and the Public Hearing next Monday, June 24th, at the Planning Commission meeting. Wendy Leece pulled item #15, the new contract for CEO Hatch, for discussion. Actually, she was concerned about the timing of Righeimer's Daily Pilot commentary providing all the details of the proposed contract amendment last week before the council had a chance to vote on it tonight. I mentioned contract City Attorney Tom Duarte's response. I've not heard back from him yet. Seems peculiar that the details discussed in a closed session would be divulged BEFORE the council had a chance to consider and vote on them. I'll report back when I hear back. The contract was approved on a 5-0 vote. The issue was never about whether Hatch deserved a raise. In fact, one speaker stepped up and said he should have had it a year ago! The council voted on all the other items on the Consent Calendar in one vote, 5-0. So, for example, they approved the Parks and Recreation Commission's request to change the Field Use Allocation Policy without discussion. This will be floating back before the council and I suspect there will be A LOT of discussion by the various user groups that are impacted by this change at that time. At 7:45 we finally got to Public Hearing #1, the Public Nuisance Abatement Policy. An hour and a half later, after many speakers addressed this issue with concern and the council flogged it, the decision was made to NOT consider this a "first reading" because the proposed ordinance needed too much work. It will return to the council for the real "first reading" the first meeting in August. Many concerns were expressed by council members and the public about the overly-broad language in the ordinance. It's clear that one of the intentions of this ordinance is to provide a tool to "manage" drug and rehab homes and problem motels - I'm OK with that because we have too few tools in our toolbox for that purpose - but many expressed concerns about the possible mis-use of this particular version on regular residents. I actually heard the term "gestapo" uttered by a staff member during the discussion! I think the council did the wise thing by voting, 5-0, to shove this back to the staff for a major rehab before moving forward. We'll write more about this when it returns this summer. Following a much-needed fifteen minute break the council re-convened at 9:30 for another contentious issue, Public Hearing #2, the Community Development Block Grant (CDBG) Public Service Grant Allocations. You can read the staff report HERE. This item had been continued from an earlier meeting during which it became clear that some members didn't want to use these funds for some of the organizations recommended by the ad hoc committee charged with evaluating and recommending the amounts. Mensinger, for example, preferred to put these dollars into infrastructure improvements, citing that it was "borrowed money". Geez! Anyhow, Hatch had modified the recommendations, chopping funding for several of the organizations and recommending only about 2/3 of the available funds be used, with the remainder going back to capital improvements. At that time there was vagueness about the amount of money actually available from the government. That issue was resolved and we were told there was actually more money available than anticipated. One might have thought that revelation would soften the positions of certain council members - NOPE! So, the upshot is that, on a 3-2 vote (Mensinger and Righeimer voting NO), the council voted the CEO recommendations on Attachment A except they added $41,000 when they chose to restore the $20,000 for Collette's Children's Home, the $10,000 for Alzheimer's Family Services Center and provide $19,000 to Youth Employment Services and $10,000 to Elwyn. Genis led the charge with crisp reminders of the obligation the council had to the previously-approved Consolidated Plan and Monahan and Leece went along. In fairness to the opposition, they had proposed to consider funding YES and Elwyn via the General Fund in the budget considerations later, but there was no guarantee that would happen. This was a good move by the council. Oh, yes.. Righeimer had earlier excused himself while the potential funding for Mercy House - he's a board member - was considered. The council approved the CEO's recommendation on that one, 4-0. 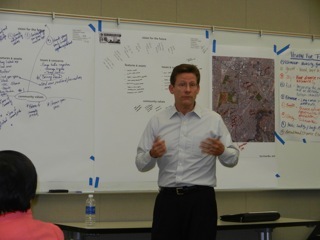 Next up was Public Hearing #3, dealing with CDBG and HOME funding. They took ten minutes and approved the staff recommendation on a 5-0 vote. At 10:50 the discussion of the Municipal Budget began, with Hatch and Director of Finance and Information Technology, Bobby Young, carrying the ball. You can read that staff report HERE. It includes a fifteen (15) item list prepared by Hatch with his recommendations folding in the comments by council members during two previous study sessions on this issue. As the discussion proceeded and decisions had to be made about where to find funds for some of those items, Mensinger suggested one source might be Hatch's $1 million contingency fund. Righeimer slapped that one back with gusto, indicating they were NOT going to use the Contingency Fund before the budget was even approved. I smiled. Nine residents stepped up to address issues in the budget - most of them concerned about spending $650,000 for lights in Fairview Park parking lots. This issue, alone, generated a lot of heat and not much illumination (sorry, couldn't resist). One of the most laughable parts was when Mensinger had the staff play a video clip he apparently made as he drove through the south part of Fairview Park one night, alternately turning on and off the headlights on his truck to demonstrate how dangerous it was at night in the parking lot without lights. On, Off... On, Off... On, Off. I found myself wanting to scream to him, "Well, don't turn your lights off, you dummy!" - but I didn't, although I do confess to muttering it to myself. Eventually, the council voted on this part of the budget all by itself, and it passed on a 3-2 vote, with Genis and Leece voting NO. Eventually, it was decided to look for funding for items 9, 10 and 11 - all capital projects - in the fall, after we see how the budget year is progressing. Items 12, 13, 14 and 15 might find funding from savings from the Jail outsourcing, although Genis expressed concern that those savings should actually be plowed back into law enforcement needs. The council passed our Fiscal Year 2013-2014 budget of $132,280,839 on a 5-0 vote as the clock struck midnight. It seemed somehow appropriate. Following a seven minute "new day" potty break, the council passed Public Hearing #5, the Appropriations Limit, 5-0. They also made short work of Old Business #1, the three-year contract for managed investment services when they voted, 5-0 to award the contract to Chandler Asset Management, Inc. to help Young and his staff manage our assets. 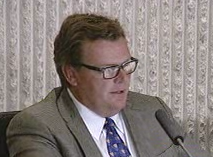 New Business #1 was the selection of a replacement for Shawn Dewane, who resigned due to scheduling conflicts, on the Pension Oversight Committee. This is the group that has been meeting WEEKLY since it was formed - it will meet again tonight. The staff report, HERE, contains the applications for those who had previously applied, but had not been selected, from which the council was expected to choose a new member. So, logic might suggest you'd look them over and pick the most qualified person, right? Guess again! Leece did just that and suggested the council appoint Thomas J. Lightvoet to the committee. Looking over the information provided he looks to be the most highly qualified candidate - by far! In fact, if you were to attempt to build the perfect resume for this kind of a volunteer assignment, his would be the one you'd come up with. He's worked for one of the most prestigious investment consulting firms in the country. He owned his own pension advisory business. He was a trustee of the Orange County Employee's Retirement System for decades. However, when Righeimer heard that name he reacted like he'd just stepped in dog poop! He didn't even attempt subtlety when he threw that nomination back in Leece's face. His reaction surprised even me, and I'm used to seeing him in these little fits of pique. Instead, he offered up Ronald Robertson, a 25 year resident and small business owner (construction-related) whose adult children all went to the same school Righeimer's girls attend. Robertson, who may be an absolutely great guy, has NO experience that is relevant to the assignment on the Pension Oversight Committee. He was chosen on a 5-0 vote. Imagine that! Finally, the council spent the next 20 minutes or so discussing New Business #2, the screening request for a Westside live/work development, before adjourning to the meeting of July 2nd at 12:35 a.m. Yawn!